Brussels - European airport trade association ACI Europe released its traffic report for May 2018, during which average passenger traffic in geographical Europe grew by +6.1% compared with the same month last year – a slight deceleration compared to Q1 (+7.6%). The non-EU market continued to lead the growth dynamic, with passenger traffic up by +8% (+12.5% in Q1). While gains were especially strong at airports in Georgia (+27%), Iceland (+26.5%), Montenegro (+22.2%), Ukraine (+20.7%), FYROM (+16.1%) Albania (+14.1%) and Israel (+12.5%), the pace of growth was more moderate in Russia (+8.6%) and Turkey (+7.5%). The EU market saw passenger traffic increase by +5.5% (+6.2% in Q1) - with ATC & airline strikes, the lasting impact of the bankruptcies of Air Berlin & Monarch as well as weather disruptions limiting growth. As in previous months, airports in the Eastern and Southern parts of the bloc along with Finland and Luxembourg significantly outperformed this average. Passenger traffic at the Majors (top 5 European airports) grew by +3%, on the back of a rather contrasted performance. While Frankfurt came on top, with an impressive +9.5% increase, Istanbul-Atatürk registered the lowest performance at -0.3%. Meanwhile, passenger traffic grew by +3.1% at London-Heathrow, +3% at Amsterdam-Schiphol and +2.1% at Paris-CDG. Freight traffic was almost flat in May across the European airport network at +0.8% - confirming a significant downward trend since the beginning of the year. Aircraft movements were up +2.6%, increasing by just +1.9% in the EU market – again a reflection of ATC & airline strikes, the bankruptcies of Air Berlin & Monarch and weather disruptions. Aircraft movements increased by +4.2% in the non-EU bloc. During the month of May, airports welcoming more than 25 million passengers per year (Group 1), airports welcoming between 10 and 25 million passengers (Group 2), airports welcoming between 5 and 10 million passengers (Group 3) and airports welcoming less than 5 million passengers per year (Group 4) reported an average adjustment +5.4%, +5.1%, +8.4% and +8.7%. The ACI EUROPE Airport Traffic Report – May 2018 includes 229 airports in total representing more than 88% of European air passenger traffic. 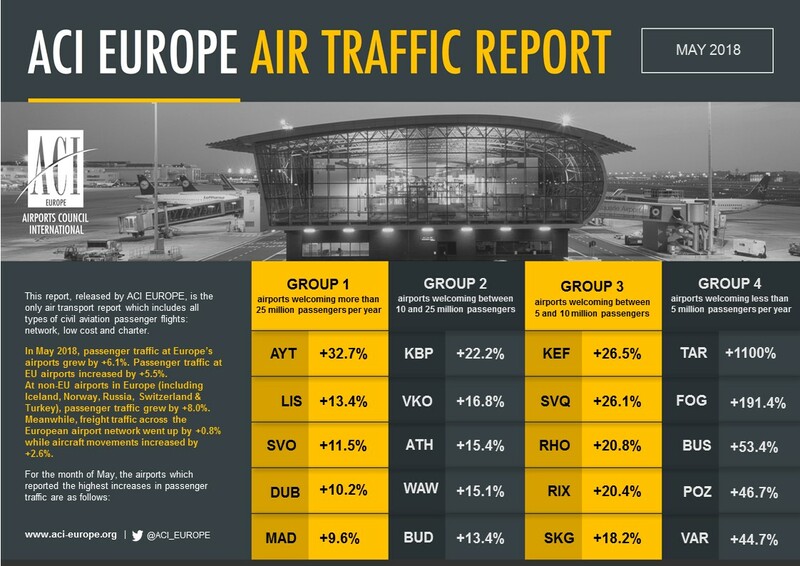 ACI EUROPE’s monthly Airport Traffic Report is unique in that it is the only one to include all types of airline passenger flights to, from and within Europe: full service, low cost, charter and others. Αναρτήθηκε από geop στις 9:28 π.μ.